I recently saw a commercial that had a baby in a walker which had me thinking about this device. There seem to be two products referred to as baby walkers. I am not talking about a push toy (looks like this)as some people get confused and because they can be called walkers as well. I actually have a push toy for my little guy and really like the push toy and all the different ways it can be utilized. 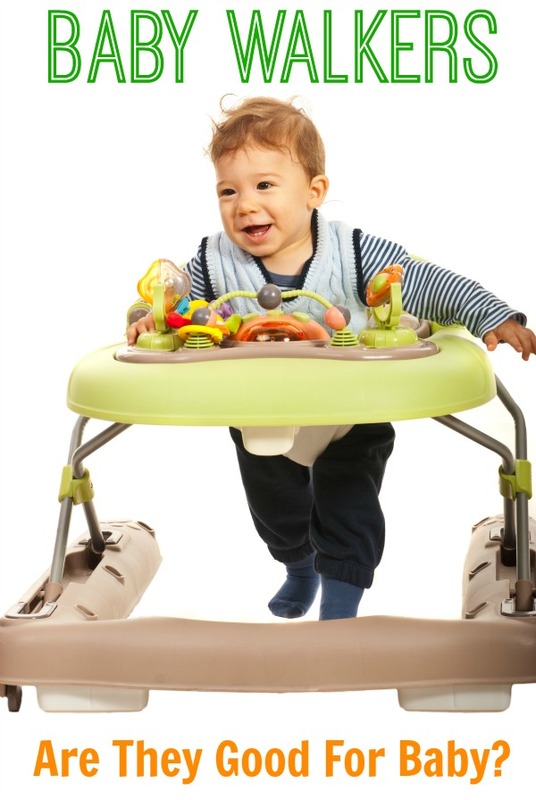 What I mean by baby walker (looks like this) is the device that a baby can sit in and move their legs to cruise around. First a little background, walking generally occurs on average from 9-15 months. In order for walking to take place your baby’s body must be strong enough and all systems must be able to talk to each other meaning the brain must be able to tell the body what to do and the body must be able to tell the brain where it is. Motivation is also key in a baby learning to walk. Are Walkers Bad For Baby? 1. Safety needs to be taken into consideration. Data indicates there is a considerable risk for major and minor injuries. Therefore the American Academy of Pediatrics recommends a ban on the manufacture and sale of mobile infant walkers. As of now walkers are not banned in the United States, however in Canada they have been banned. 2. Walkers do not help a baby to walk earlier. Research shows that baby walkers actually delay motor development. The study found that baby walker use was not associated with achieving sitting with support, sitting alone, standing with support, and walking with support. The study found strong associations, between the amount of baby walker use and the extent of developmental delay. 3. Walkers are just another device that constrains baby. It limits a baby’s ability to work on strengthening of their core and upper body. It limits a baby’s ability to work on crawling and exploring their environment. It also limits the sensory input that the baby would get from time on their tummy. Tummy time and playing with your baby on the floor is the best option for promoting motor development. So why do people use walkers? These are just a few things that I’ve had people tell me as to why they use them. I don’t think that anyone uses them with ill intention. That’s why it’s important to spread the word on the use of equipment such as baby walkers. To keep baby occupied– There are different options to keeping people occupied. I caution against any kind of device that contains a baby including jumpers or exersaucers for long periods of time. Moderation is key. I have used a diaper box or laundry basket for very short bouts of time when I needed to have the baby right next to me. Another great solution is using a play yard. These allow for baby to still get plenty of play time on their tummy, sides, and back and also give you a piece of mind that they are safe if you have to run to the bathroom! If a device is a must I prefer stationary over a moving walker. To help baby walk earlier – As mentioned above research has shown that this is not the case. It has been shown to actually delay motor development. A key to helping your baby walk earlier is plenty of floor play and tummy time. I have several different ideas on how to incorporate tummy time into your baby’s day including water play, activity table play, and ball play on the tummy. To strengthen the baby’s legs– Research has shown that time in the walker isn’t going to help baby to walk any faster. When in the walker the baby’s legs are often in an unnatural position. Baby’s can’t even see their legs when they are in the walker. Remember that when a baby learns to walk there is the communication between the brain and the body. Having the legs in the wrong position and no ability to even see the feet doesn’t help with this communication. Using a walker to try to “jump start” the walking process is not recommended. Avoiding walkers is what best for baby. The research shows they are of no benefit to development but actually the opposite they delay it. There is documentation of injuries both serious and minor as a result of walkers. If you need time and a place to safely occupy baby try a play yard or stationary devices (in moderation). I can totally agree that they are useless contraptions and dangerous. My mom had given me one as a gift when my daughter was old enough to be in one. Not only did my daughter not care for being restrained in it, the darn thing also colapsed while she was in it. It was locked into place and being used properly and my daughter is in no way over weight so it had no reason to fall while she was in it. We were lucky she wasn’t hurt. Ironically the brand was Safety First. Oh I’m so sorry to hear about your experience! I’m glad your daughter was okay! This is interesting. Thanks for the information. I knew that walkers didn’t help them to walk earlier but I didn’t know that they could actually slow development. I’m curious to know your thoughts on jumpers and excersaucer type toys. Hi thanks for reading. I actually did a post on jumpers https://www.pinkoatmeal.com/2014/03/jumpers-bad-babies-understanding-physical-therapist-may-answer-yes.html that I encourage you to check out. Exersaucers are much the same as jumpers. There is a great post at Mama OT on those http://mamaot.com/2012/05/03/exersaucers-the-good-the-bad-the-better/ Hope you find this information helpful! Thank you! Everyone says I’m strange because I never used a bumbo & refuse to use a walker. Glad to know the professionals back me up. Ok I used a walker for all 3 of my kids and if hampered development I didn’t see it and in the case of my daughter was glad of it since she started walking on her own accord at 8 months! All 3 of my kids got tummy time and other exercise but they liked being in the walker so they could be upright. None of them liked being a lying down position for long. (I am talking from 5 months on.) Even when held they wanted to be upright. Like I said my oldest walked at 8 months, my son 10 months and the youngest decided crawling was way better but still walked before her first birthday. To address the dangers I still think most of the dangers were from stupid parents that would have the walker in an area that had steps or other hazards and didn’t watch their kids. I personally think that walkers have gotten a bad rap and nothing you stated above shows any proof otherwise. just another opinion. I’m glad your kids did so well. It was my hope to share information with others on what is out there on walkers. Thanks for reading. I’ve started to use walker for my baby since 8 months old. After using walker, now she stands tiptoe. Whenever I tried to correct her, she can’t bear weight an fall down.